In 2014, the British Standard Code of Practice for Slating and Tiling, BS 5534, went through a major overhaul requiring roofers to completely change how they work on pitched roofs. Of major significance is the change that relates to tile fixings where all single-lapped interlocking tiles must now be mechanically fixed to the roof and twice fixed at the perimeters. The changes to legislation are a positive move from the perspective of making pitched roofs more secure, however there has been some concern among builders and roofing contractors about extra labour cost and project timelines as a result. Added to this are the concerns with regard to the Government’s ambitious goal of achieving 200,000 housing starts annually. A 2014 survey conducted by residential property consultants Knight Frank revealed that 94% of developers don’t believe that the Government goal is achievable in the long term. Whilst additional mechanical fixing doesn’t impede the experienced roofer it does certainly increase overall installation time and the impact on a project when installing thousands of tiles is considerable. A solution that can offer time saving benefits therefore, can have a significant value. At Redland they are continually developing products in an effort to make life easier for the contractors using their products and help to lower compliance costs. The number-one rule of product development is that it should meet the needs and requirements of the customer. Redland’s revolutionary tool-free Innofix Clip certainly does exactly that. The Innofix Clip is the fastest and easiest tile fixing available on the market – up to 40% quicker than using traditional nailed clips. 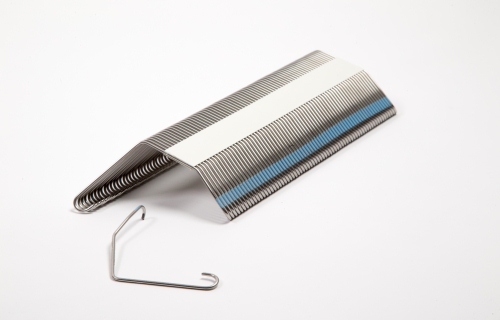 The clips are installed without the need for a hammer and come ready to use in a unique magazine style holder, ensuring they are tangle free and can be easily removed from the packaging with one hand saving even more time. Suitable for use throughout the UK, Innofix Clip is Redland’s strongest clip yet and meets the stringent requirements of the new British Standard. Making life even easier for roofing contractors, a wide range of clip sizes have been developed and colour coded for easy recognition. The colour coding helps the roofer to determine which clip is suitable for the tile being used. There are five clips in total which cover the complete range of Redland interlocking concrete tiles. One particular attribute of the clip that is universally appreciated is the click noise made to confirm a secure fit under the batten, signalling that the tile is fixed in place. In this day and age it seems that hardly as day goes by without there being news of a new product offering from construction product manufacturers. To find a product that is truly innovative and offers outstanding benefits to the end-user is becoming increasingly difficult – it’s great to see manufacturers such as Redland developing innovative solutions to truly meet a need.